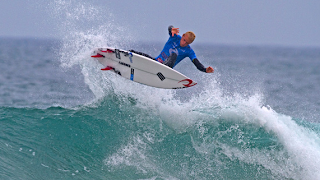 The Rip Curl Pro - the world's longest running and most prestigious professional surfing contest - will take place around Bels Beach from March 30 to April 10 this year. Adam Melling and Owen Wright will be joined by wildcard Stu Kennedy in round 1. Layday today. Swell forecast is not looking real good. Stuey was thrown out in some of the worst ever conditions for a Bells event today and couldn't find the high scoring lumps of crap to win. He will surf next in round 2 heat 1 against Durbo. Mello will surf in the second heat of the day when competition resumes. Mello looked the goods to take his first CT heat win only to have it snatched from him in the dying minutes. He moves to a round 2 match-up against Dan Ross. Owen lost in a really close heat and will destroy Ben Dunn in round 2. Bad luck for Stuey today going down with a 12.06 to Bede 13.16. Just competing in a WCT at this early stage in his career is a fantastic privilege and great experience. Owen won a nail biter and booked a place in round 3.